Chances are most of what you print out at home comes from Internet pages. Things like invitations, coupons, schedules, even coloring book pages for the kids. So HP had a thought: why not skip a step and just let you print content straight from your printer. To do this, you’ll need the new HP PhotoSmart Premium with TouchSmart Web multifunction printer. Its 4.33-inch web-connected touchpanel lets you scan, copy and fax—and most importantly, use Print Apps (the initial apps are free) to print content from the web simply and conveniently. Disney Online: Encompassing Disney.com and DisneyFamily.com, it will include coloring pages and craft projects and even recipes you can print out for the kids. Maybe we’ll see some Marvel characters in there soon since the Mouse House bought out the superheroes last week? Coupons.com: Save money by printing coupons for groceries, restaurants, entertainment and more. Snapfish Photos: Print your Flickr photos directly from your printer. Tabloid: Select and combine any of your RSS feeds from blogs and websites and create custom newsletters. Google: Maps and calendar applications are included here. Fandango: Get movie tickets without any major browsing. 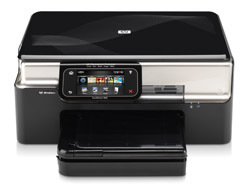 The printer is also Wi-Fi-enabled so you can put it anywhere in the house—not necessarily next to your computer. It retails for $399. Hi! Nice information in details. It is really very informative. Bookmarked and sharing for friends.